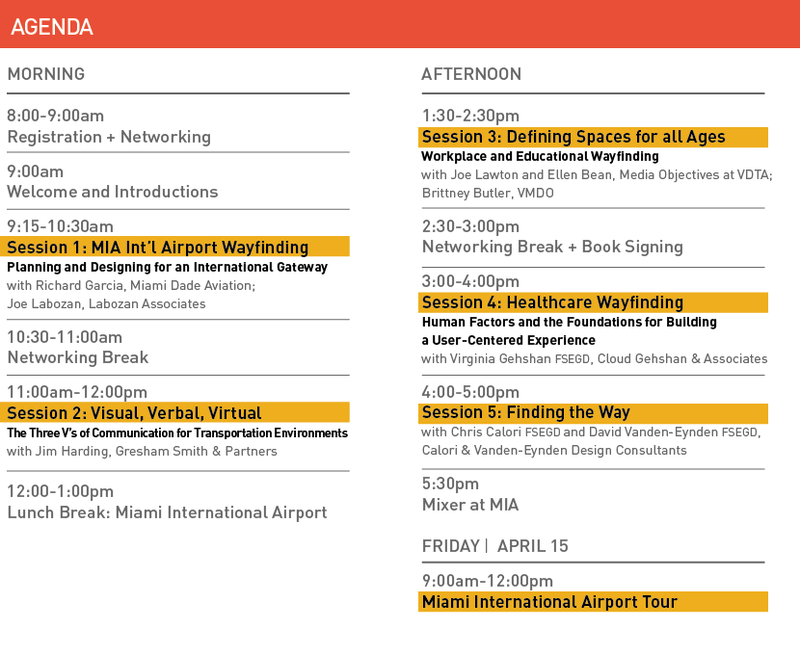 SEGD is excited to hold the annual Wayfinding event in Miami this April, hosted by Miami International Airport. The two day event starts on Thursday April 14th with a full day of talks and dialogues focused on learning for transportation, workplace, education, and healthcare environments. In the morning we will focus on Transportation Wayfinding with talks centered on the expansion and improvements at our host airport, MIA, led by Labozan Associates and the internal team at Miami International and second session focusing on the 3Vs of Wayfinding for Transportation environments led by Gresham, Smith, and Partners, another leading expert in transportation wayfinding. The afternoon will consist of sessions led by experts in workplace and education wayfinding systems as well as a session on best practices for healthcare wayfinding. The day will wrap up with a much anticipated keynote from SEGD Fellows Chris Calori and David Vanden-Eynden with their perspective on the state of wayfinding and practice. Friday April 15th will consist of a tour of MIA airport's new facilities. Join SEGD in Miami this April and amplify your wayfinding education for 2016! There's nothing quite like your name in lights! Now that's the way to greet the SEGD wayfinding community! It's not every day that SEGD gets to take over the main sign to the entrance of an airport. Especially Miami International Airport, the second largest airport in the country with just over 44 million passengers last year! With the goal of improving the customer experience for its 40 million annual passengers, Miami International Airport has recently completed wayfinding packages for its North, Central and South Terminals using standards developed by Labozan Associates. The key challenge of the program was to reduce signage to reduce clutter--without compromising wayfinding ease. MIA is the site of SEGD's 2016 Wayfinding Event April 14-15 and this is your chance to tour the airport and learn from the challenges of planning and designing this international gateway! Where can you discover the latest apps and digital signage technologies being used in airports? And learn how human factors research should be informing your next healthcare project? And see the latest in wayfinding/branded environments hybrids in workplaces? 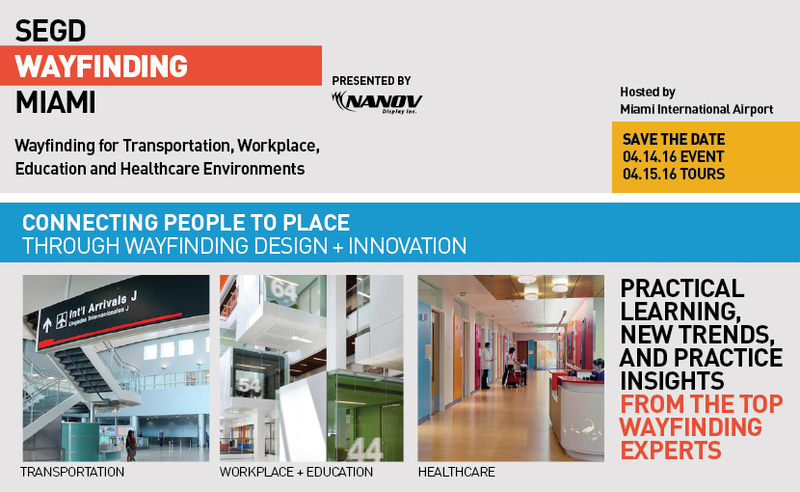 You’ll want to find your way to Miami April 14-15 for SEGD’s 2016 Wayfinding Event! Here’s your map. With a background in human factors and cognition as well as design, Virginia Gehshan, FSEGD, has directed Cloud Gehshan Associates’ wayfinding programs for numerous healthcare facilities, campuses, park systems and cities. Her practice is founded on a user-centered approach that employs rigorous research and analysis, a methodical design process—and the recognition that empathy, not signs, is the most important element in wayfinding. Wayfinding for transportation environments calls on all the fundamentals of the discipline, with a very crucial addition: the element of time. To create a truly comprehensive, highly functioning wayfinding system, Jim Harding, Gresham Smith and Partners, says you need to consider the three ways airport users will receive the information. He’ll focus on the Three V’s of Communication for Transportation Environments at SEGD’s 2016 Wayfinding Event April 14-15in Miami. You’ll want to be there! Whether it’s for high-tech start-ups or more traditional corporate environments, workplace wayfinding has a unique triple mission: not only to guide visitors and employees through complex spaces, but also to create a strong sense of place and support the brand. Joe Lawton and Ellen Bean Spurlock of Media Objectives at Valerio Dewalt Train Associates, along with Brittney Butler of VMDO, will lead the Workplace Wayfinding session at The SEGD Wayfinding Event April 14-15 in Miami. You'll want to be there! SEGD Wayfinding 2016 -- Where Do We Go From Here? Technology is rapidly changing the delivery systems we use to navigate the built world, but the fundamentals of wayfinding have barely changed since Kevin Lynch coined the term more than 50 years ago. Chris Calori and David Vanden-Eynden (Calori & Vanden-Eynden / Design Consultants, New York) have developed hundreds of wayfinding systems and literally wrote the book on Signage and Wayfinding Design. 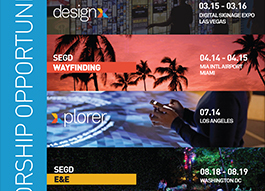 Keynoting SEGD’s Wayfinding event April 14-15 in Miami, they'll take a critical look at the complex present and warp-speed future of wayfinding. Wayfinding projects for transportation, workplace, education and healthcare environments share some core similarities but also offer widely divergent challenges. At SEGD’s 2016 Wayfinding event, we’ve gathered some of the world's leading wayfinding experts to share the latest best practices, trends and insights with you.